The BLT [Bacon-Lettuce-Tomato if you dare not know], might just be the most underrated sandwich there is. It shares its lowly status with the sardine sandwich, liver sandwich, and tongue. There might even be an equation—or possibly just a graphable body of data-- that while young, it is the holy grail of grilled cheese that rates as favorite. As we age we teeter off for the more classic sliced meats, and as old age creeps in, we can return to the classics: sardine, liver and tongue. But where is the BLT in the equation. And more importantly, am I old too young because I appreciate a good sardine sandwich on rye? A schmear of liver? A slab of tongue? Actually, scratch the tongue—I could never get over the bumpy texture. Who orders a BLT? It is a perfect meat-to-vegetable-to-crisp-lettuce ratio in every bite and yet, it is too often overlooked for something “more hearty”. I am known to pass by it on a menu, even when that sweet-salty bacon is all I crave, unable to spend $5 for what I consider a $3 sandwich. To spruce the classic up, I have seen restaurants create the BALT (adding avocado), a BBLT (with brie), and even [gasp] TBLT (turkey bacon)! But nobody seems to understand it is no longer its simple and perfect self when this happens. I awoke Sunday morning craving breakfast, but also a BLT. How to make a breakfast version without destroying the BLT's simplicity? I headed over to the butcher while I considered my options. I had him slice up fresh bacon, ¼ inch thick (thick bacon being the key to a BLT). As I passed the bakery to grab my bread I saw the solution: Sureki. Sureki is the Greek’s Challah-- a sweet braided egg bread. I picked up the loaf envisioning my goal: The FBS. 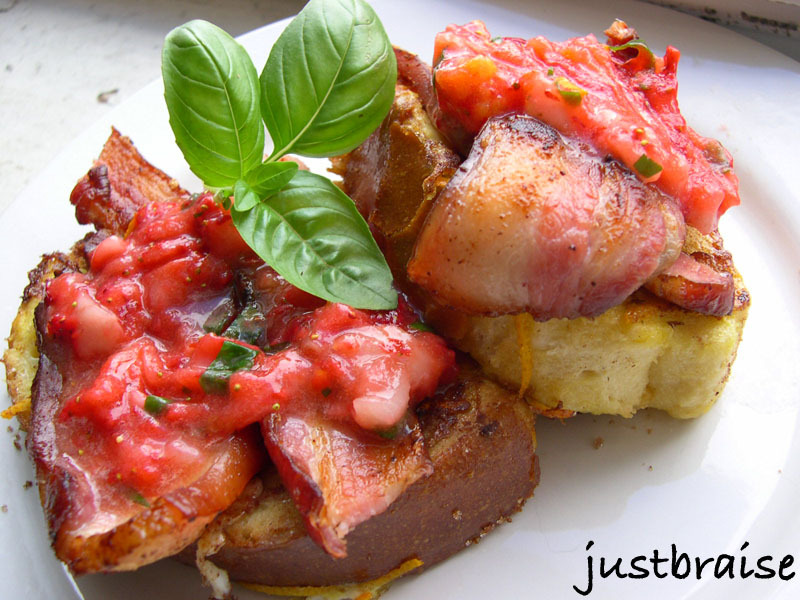 FBS, or French Toast-Bacon-Strawberry, is the perfect Sunday morning breakfast sandwich. Offering the best parts of the BLT: crisp bacon and fluffy bread, with a sweeter breakfast flare. Instead of your daily vegetable you receive your daily fruit. For an extra zing, lime and orange zest are used, fresh orange juice and basil as your greens (instead of lettuce). Makes 2 servings. Active Time= 15 minutes. 1) Place one skillet (for bacon) on medium-high heat. Place one skillet on medium heat (for the French toast) with butter. 2) In a wide-brimmed bowl, crack eggs, add milk, juice from ¼ of the orange and orange zest. Beat until well mixed. Drench bread slices in egg mixture until well-drenched. Once egg mixture is done, the two skillets should be warmed. 3) Place bacon on skillet to cook. Place bread on second skillet. Cook 3-4 minutes one side, flip, 3-4 minutes opposite side. Cook until golden brown. Depending on preferred doneness, bacon should receive 4-5 minutes each side. If bacon finishes before bread, place bread in oven to stay warm, set at 250F. 4) Keeping an eye on the bread, make the strawberry topping: Combine strawberries, lime zest, juice from ¼ orange and basil in a small bowl. Using a fork, mash the strawberries into a thick pulp. Serve at room temperature, set aside until ready to serve. 5) Once bread is done, sprinkle with cinnamon and sugar (*do not put this on while on the skillet as it will just burn. Putting this on after it is done cooking will allow the mixture to melt right into the bread). 6) Remove bacon when ready. 7) Sandwich can be open-faced or closed. Layer the sandwich: French Toast, Bacon, Strawberry mixture. Head on over to Sweetnick's for today's ARF roundup! Head on over to Kalyn's Kitchen for the WHB roundup!